Stocking up and (almost) a couple of pictures as promised! Although the last lot of snow has almost melted everywhere forecasts predict heavy falls here again from tomorrow afternoon starting in the West of Ireland today. I have spent this morning stocking up on meat for my freezer, going to the bank, posting some parcels for across the water, carrying in kindling and in a nutshell getting essential duties out of the way in case I get totally snowed in once more! The temperature has dropped by at least several degrees since I got up, the sky has darkened dramatically and the wind is now blowing strongly making it difficult to take any successful pictures of felt created to post to Flickr or here on the blog. I JUST DON’T BELIEVE IT!!!!! Heavy hail/sleet is now assaulting the house so I am very glad I made the effort to drive to Borris this morning! Anyway, enough talking. Here are two pictures (or maybe not!!!) 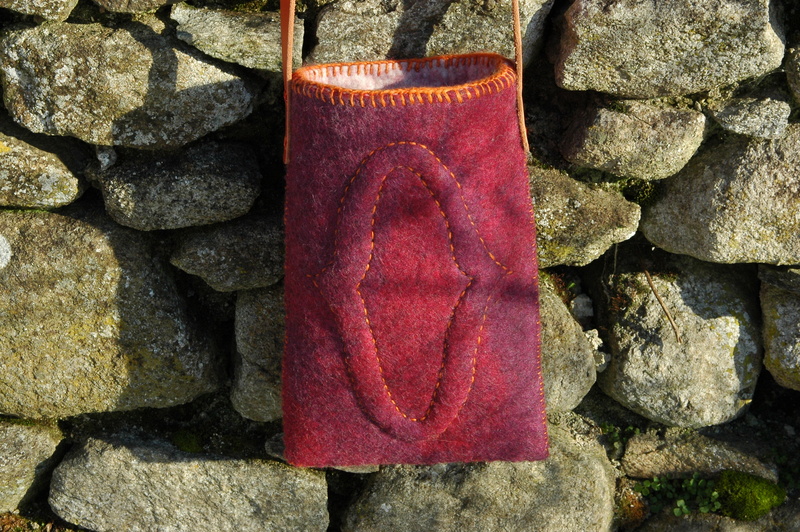 taken in the gloomy outdoors, my latest Vanda Robert inspired bag and a gorgeous light weight nuno felt wrap. For the bag I used some 50% gotland 50% merino blended wool batts from Denmark and another similar quality wool (think it might also be the same combo although I bought it on a different trip from a different supplier) in wonderful shades of Autumn. I added some leather leaves and a horn button (all gathered from various trips to US!) and finished it with a cord handle which I made using some wonderful hand dyed silk yarn by Jamie of Urban Fauna Studio in San Fransisco. The wrap is felted from some of my Cloverleaf Farms hand dyed merino and silk hankies, the cotton cheesecloth I dyed with Rite under the supervision of Sharon at The Tin Thimble in Loomis, CA. Pretty cosmopolitan bag and wrap don’t you think? OK, you are going to have to look at my Flickr photos to see the bag and wrap because for some reason WordPress has lost the run of itself and my whole visuals jumped all over the place when I uploaded the photos. First time of trying they wern’t visable at all and then the second time previous posts went into the sidebars but the images still weren’t where I wanted them. Sorry! UUGH, I am SO frustrated!!! I wrote a post yesterday afternoon in the freezing cold but for some reason the internet connection went down and I couldn’t add images or get it online. Just now I have rewritten the whole thing, added some pictures and then lost everything in the publication, how annoying is that. Unfortunately I am going to have to head downstairs again in a few minutes because it is absolutely freezing upstairs and I am trying to eek out my oil and just heat the lower level. I am now snowed in for a total of 12 days and counting, amazing for Ireland in late November early December although probably just as well that I lagged my water filter with some felt otherwise things could be a lot worse than they already are! 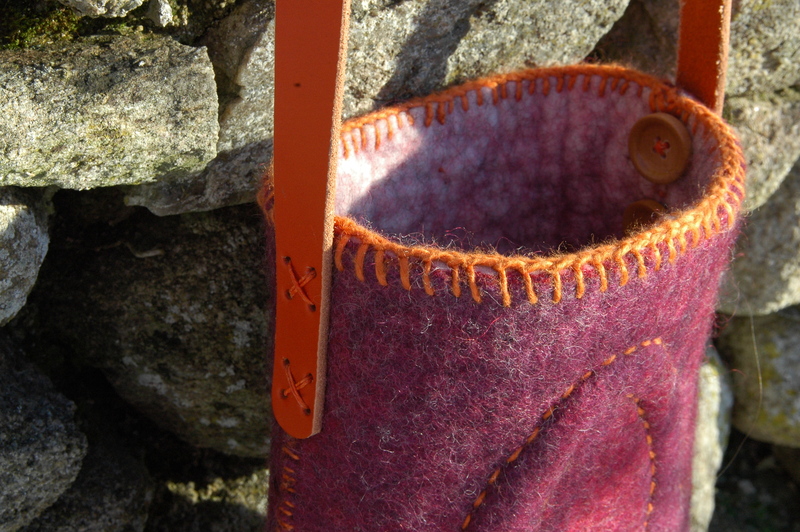 Anyway, here are a couple of photos of another felt bag a la Vanda Robert completed during my enforced incarceration and if you pop on over to Flickr you will find some more as well as a few pictures of the beautiful landscape at Clasheen in the snow. Internet connectivity difficulties persist so hopefully this quick post will beat the rot, it is also FREEZING upstairs where the computer is and I am trying to save my oil for keeping the downstairs warm incl. my studio! I am trying to felt as much as possible during the day, 1 to utilise the fibres in my stash, 2 to continue making Christmas presents, 3 to experiment with different designs and 4 just for the hell of it because I love to! Part of the benefit of limiting myself to the materials at hand and being confined to base is that I find I am trying to make sure every piece of felt ends up in a finished product and not just the pieces that I am happiest with. The bag on the left was felted on Tuesday afternoon and started as yardage for felt slippers (tutorial and kit in the making). When I assessed the design yesterday morning I actually thought that it would be a pity to cut it up too much and decided it would make a much nicer bag for carrying files, books etc. if only I could get my sewing machine out and bite the bullet on the stitching side of things. At the time I thought that I had one set of black leather handles left but imagine my surprise when I discovered that I had no black left but instead the most perfect red imaginable to finish this project! One bag later and not too much stress with the sewing machine I now am planning some Icelandic wool cushion covers and some more bags with both felt and leather handles. As you know I usually only felt bags using a resist but there is something soothing and mindless about creating felt yardage and for some reason the mood I am in with all this snow this activity seems to suit me perfectly and I think that stretching myself with a bit of sewing in no bad thing either! 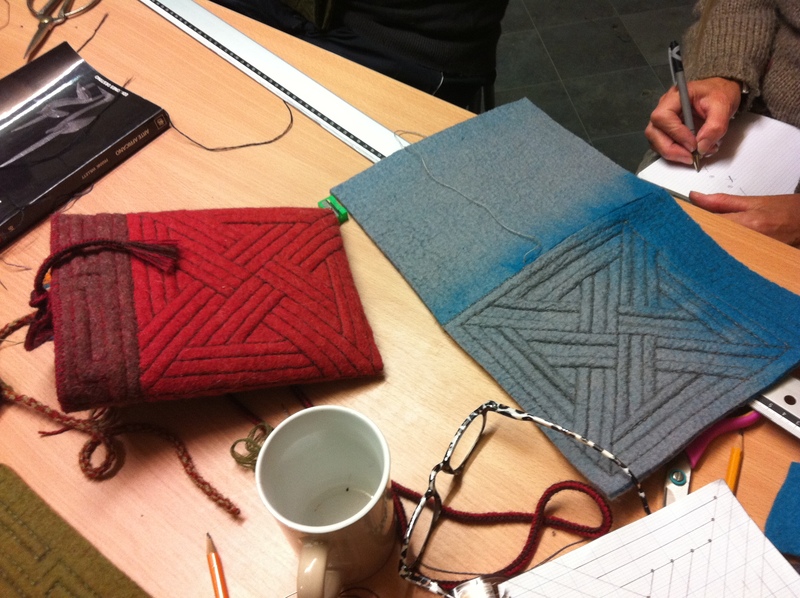 Vanda Robert’s fantastic felt bag workshop! 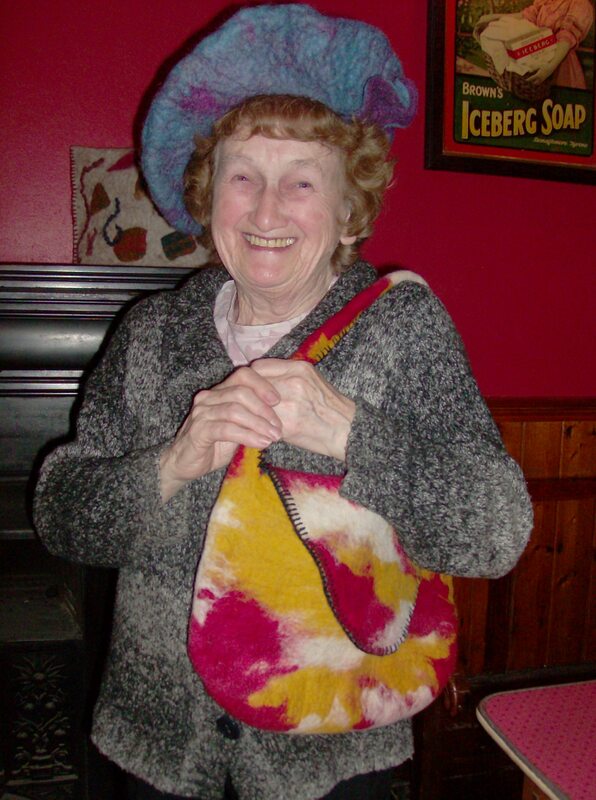 I always have a fantastic time when I participate in felting workshops with visiting international artists and my wonderful long weekend at Carmen’s studying with Hungarian felter Vanda Robert was definitely one of my highlights from 2010. As per usual, when I am a bit apprehensive about the content of a class the reality is always better than the imagining and because Vanda’s bag workshop included a LOT of stitching you can imagine how nervous that made me before the event! Carmen had almost tried to stop me attending because she knew I wanted to support her in bringing Vanda over but she also knew how stitching makes me break out in a cold sweat. The fact that the three days included the day of the golf club Captain’s Dance didn’t help either but nothing would have stopped me attending and boy am I glad I did! To start the workshop everyone looked at some of Vanda’s gorgeous bags, oohed and aahed over her relief stitching (there were also a couple of books with photos to browse through) while she explained the basics and showed us how she likes to lay out her wool batts to create thick, even and firm felt. We then choose our colours and started to lay out 10 to 12 light and even layers directly onto plastic or else onto bubble wrap. 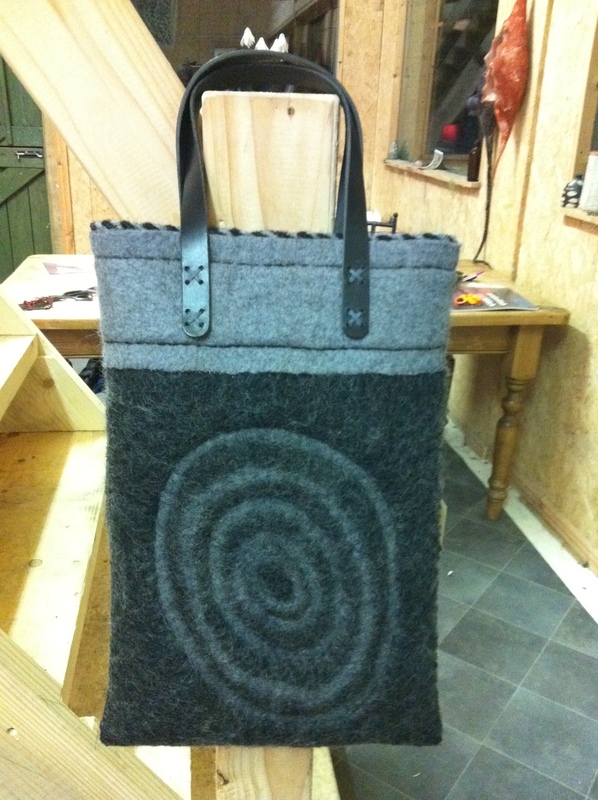 I have always wanted to create a piece of felt using Rathgeeran Rock Art (a stunning local bronze age rock) as my inspiration and was delighted to see some black merino, silvery grey merino and grey gotland which I thought would be perfect for my bag. The idea in general is to felt a thick but even piece of fabric, preferrably double sided and then cut to shape, reverse some pieces exposing the complimentary colour before stitching the design in relief (amazing stuff here!) and assembling to whole with tiny invisable stitches before adding a handle and possibly a cord edging or fancy stitching around the top. 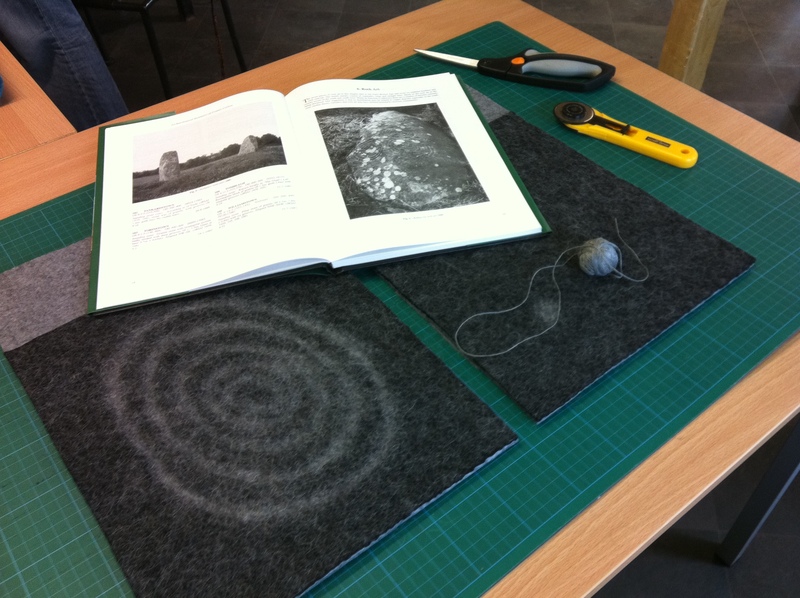 First off I created a grey prefelt using three layers of the gotland which I cut into rounds to echo the circles from the rock art. These were then laid down directly onto my bubble wrap and filled in with three layers of black merino before surrounding the design with three layers of black merino also. I then laid 4 more layers of black this time covering the whole rectangle, two layers of gotland and finished with a layer of the silvery grey merino. If you look carefully at the picture above you can see my ten layers laid out and also see that Chris who was working beside me had started to wet out and soap her bundle, half of hers is really high and half is already wet. 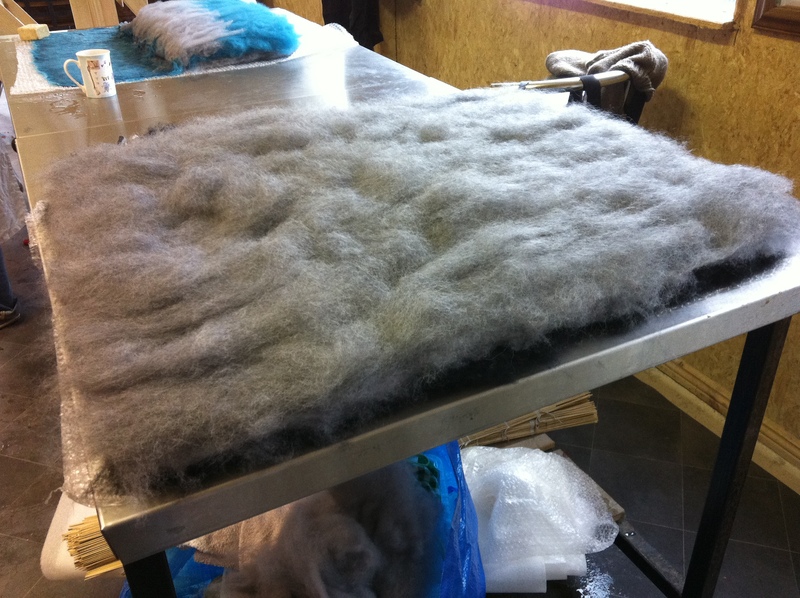 Once we had the layers fully wet we just felted as per normal until the wool had shrunk by about a third and the resultant felt was thick, firm and flat. 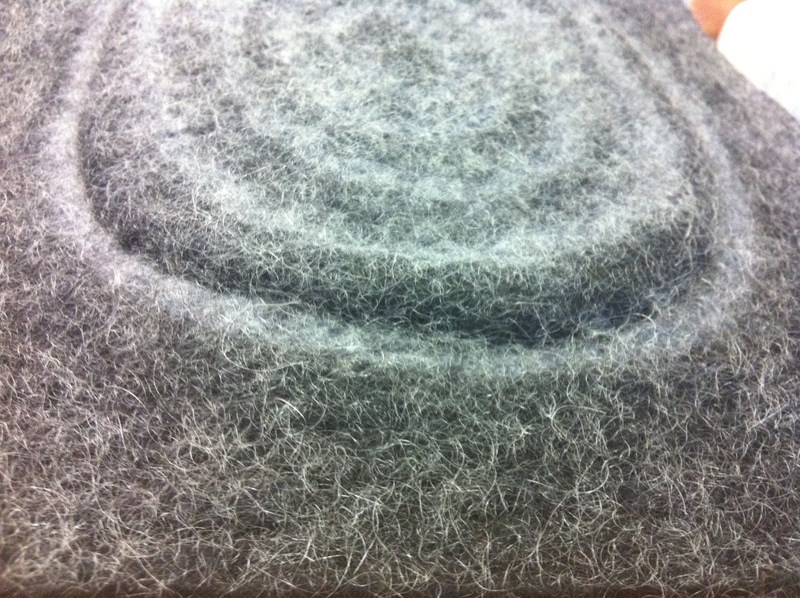 Some people rubbed the surface of their felt to smooth out any imperfections and dimples but I had brought my ridged fridge liner with me and it proved excellent for rolling the felt on and getting a nice even texture. At this stage the first day was finished and we all retired home to dry our felt, I had the dance to get to and evening wear to don! Day two saw us cutting out the picecs for our bags and then Vanda gave us a demonstration of the stitches used and we all had a go with some samples. I can’t stress enough how I would urge you to attend one of her workshops because it is in the stitching that the relief is achieved and obviously that is not something I will be trying to explain here. 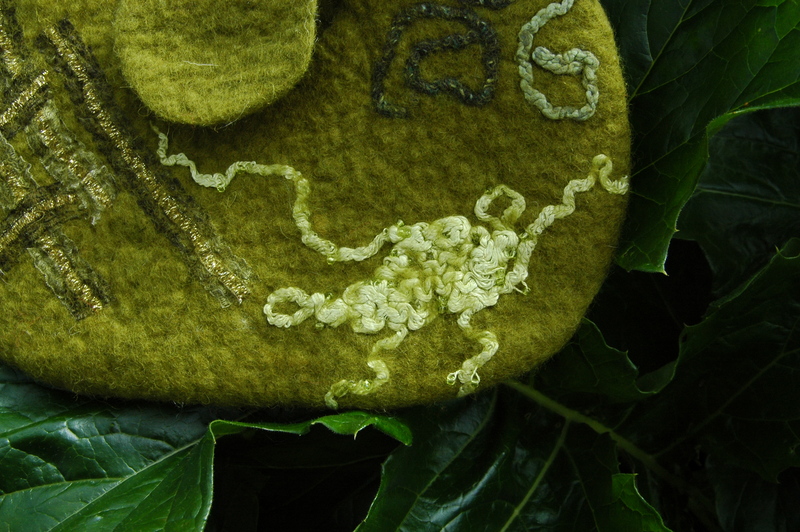 Suffice to say you can use wool, cotton or linen thread and depending on where you insert and remove your needle through the felt and at what angle you do so the stitches may be straight or when pulled cause depressions or elevations in the felt, just INCREDIBLE!!! Initially I had wanted to elevate all my silvery grey ovals but that proved a step too far for me (surprise, surprise!) as in order to do so I would have needed more space between the discs so with Vanda’s help I re-thought and decided to elevate some of the black spaces instead.